Personalized key chain gift, shipped fast! Adorable gift item that is practical for everyone - to adorn keys, decorate a back pack or add to luggage for identification purposes. Your personalized Friendly Folks cartoon in a key chain! 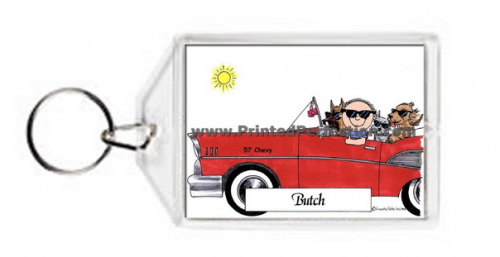 Our key chains encase your caricature inside quality, crystal clear acrylic. They are double sided too, so your print can be viewed from either side! The outer dimensions (not including the key ring) are approximately 3-1/4"w x 2-1/2"h. The personalized scene measures approximately 2-7/8"w x 2"h (about the size of a business card). These key chains also make a great back pack decoration and luggage tag identification!